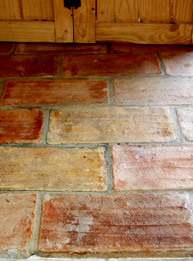 AncientFloors.com | Terra Cotta Tiles from Italy, France and Spain. AncientFloors.com : Ancient Old World Hand Made Floors. Exclusive Luxurious Handcrafted Artisan Flooring for the Ages. TERRA COTTA Tiles from Italy, France, Spain & Mexico. Welcome to Ancientfloors.com! Official tile supplier to Ralph Lauren, National WWII Museum, top builders, designers, actors/actresses, like Whoopi Goldberg and Tyler Perry, and homeowners around the country just like you! We would be honored to work with you on your project too! 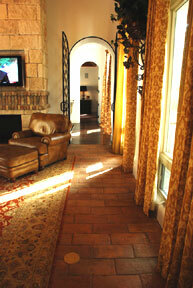 You will not find finer terracotta flooring in the USA at better pricing. We have traveled all over Europe and on this site we offer to you the finest we have found! 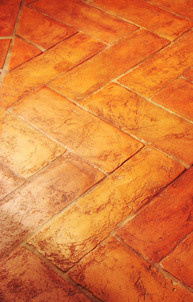 Italian Terra Cotta Tile: 12x24, 6.5x19, 6x12, 12x12, 6x6, 4x4, 20x20, shape tile. 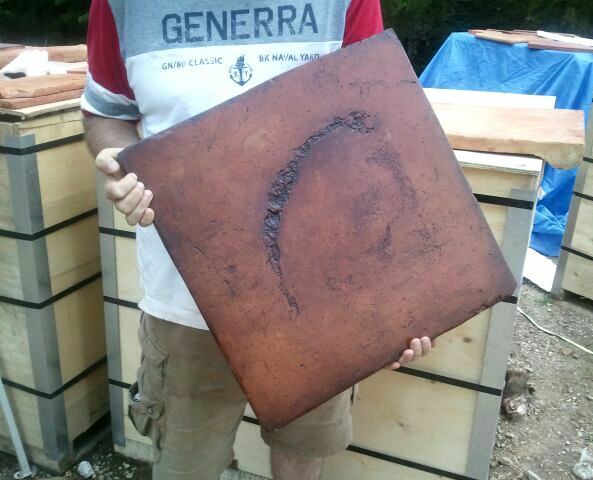 French Reclaimed Terracotta Tiles: 6" Hexagons, 6x12, 5x10. Currently expecting a new container of reclaimed 6" Hexagons and Diamonds. 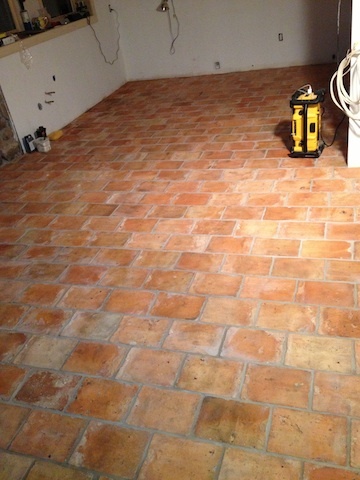 6x12" Italian Terra Cotta tiles in 6800 sqf home in Missouri. Tile currently in stock in Missouri. 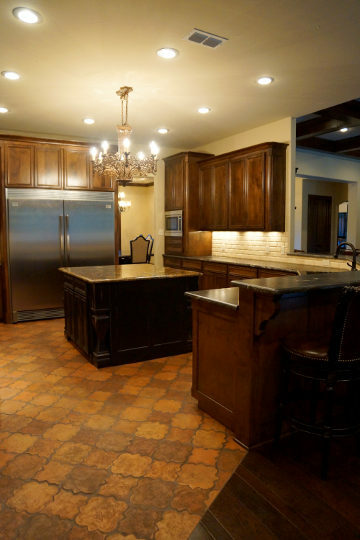 Chateau Tuscan Terra Cotta kitchen flooring. Tile currently in stock. 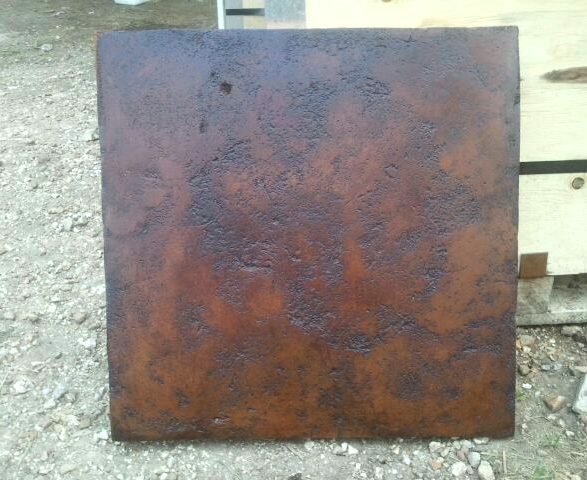 Massive 12x24x1-1/4" Italian Terra Cotta tiles. Currently in stock. 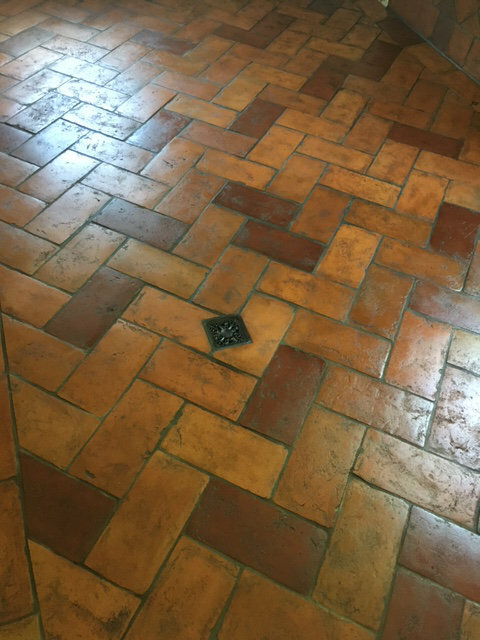 Gorgeous 12x12" Tuscan terra cotta tile. Currently in stock! 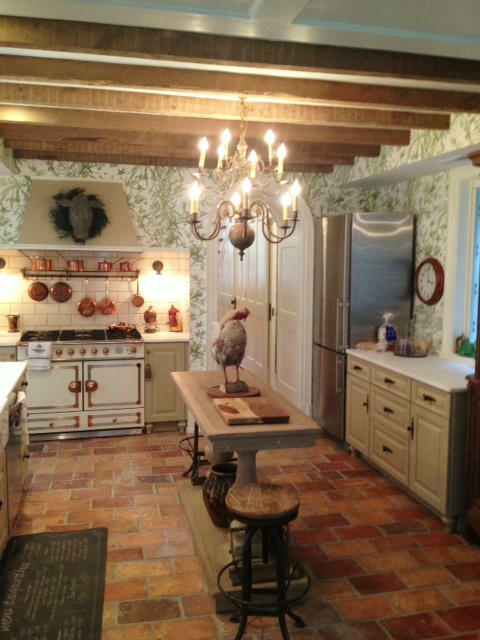 Ralph Lauren selected this tile for their store in Greenwich, Ct. Tuscan Teak Finish Handmade Terracotta currently in stock! French Reclaimed Terra Cotta Tiles on the wall: 3x12" and 6x14". French Reclaimed Terra Cotta 3x12" Tiles on the wall of a steam room. 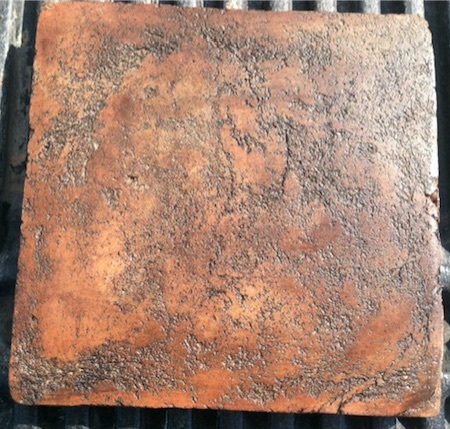 French Reclaimed Terra Cotta Tiles 6x14". 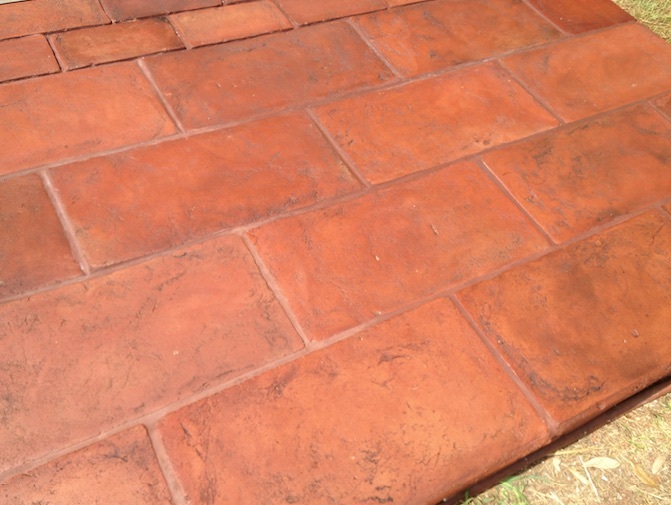 French Reclaimed Terra Cotta Tiles 3x12". 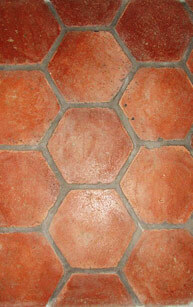 French Reclaimed Terra Cotta Tiles 6" Hexagons. 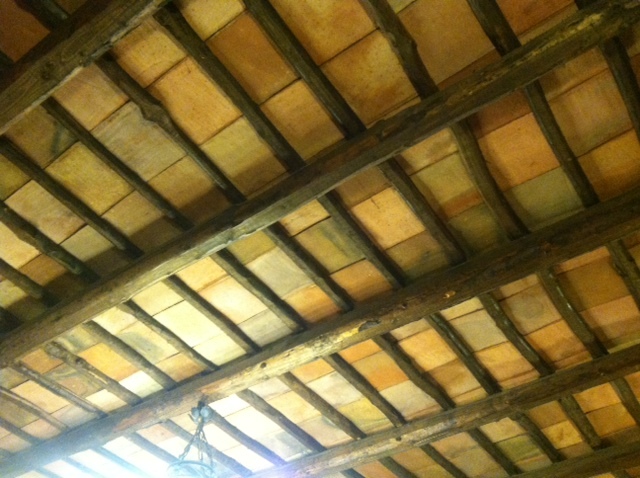 French Reclaimed Terra Cotta Tiles 6x12"
Peter Nappi Store, Nashville TN. Reclaimed French tiles. 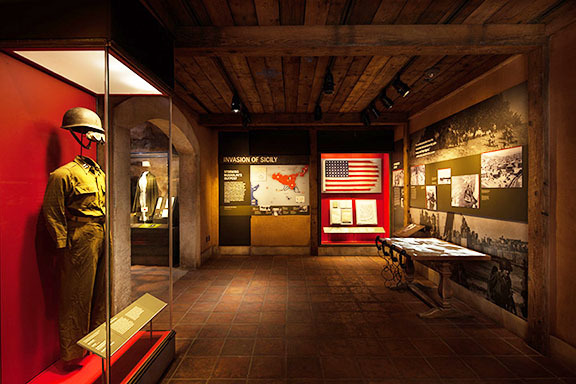 National WWII Museum, New Orleans. 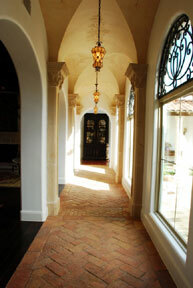 Italian Tuscan Handmade Terra Cotta tiles. One of our favorite colors. If you are trying to achieve an old world look that makes you feel like you are in a 1500 year old castle, this is your tile. Great for wine cellars or your entire house. Our training in Italy has allowed us to achieve this look with the Tuscan tiles using only water based sealers and wax from England. It is truly special and reasonably priced for a unique high end product. Similar in ways to the Old World Brown but with Red and Black hues. The tiles are hand sanded and then the sealers and waxes are used to achieve this look. Amazing if you are in need of a deep red. A very rich look indeed! This is the color that has been our most popular thru the years. Amazing as it is the natural color of the tiles with some brown accents added in the pores of the tile to give it a very naturally aged yet clean look. A very special color and one that brightens rooms that need more light and color. Tuscan tiles with no sealer or wax. This can be sanded or not sanded. The colors will range from tans, oranges, to reds. If you order your tiles sanded but unsealed, this is what you will receive. A gorgeous tile ready for your personal touch. Currently in stock in Missouri: 20x20", 12x12", 8x8", 4x4", 6,5x19", 6x12", 6x6". Please contact us about availability. 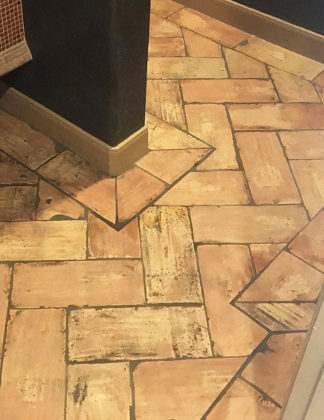 Photos reflect brown color as our client requested these tiles to be finished this way for his Tuscan style 14000 sq feet home in Fort Worth TX. 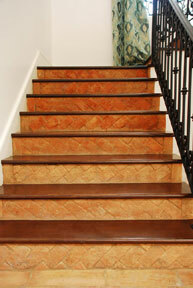 Raw tiles are in it's natural Terra Cotta colors and can be finished in any color suitable for your project. 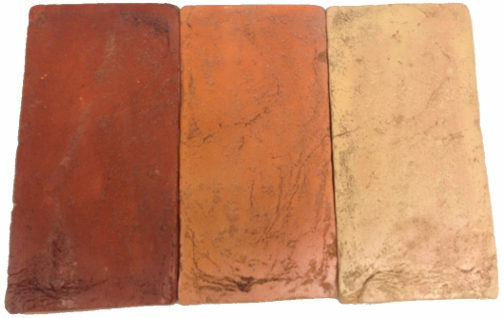 These tiles look stunning in it's natural terra cotta color, dark brown, antique red patina, pink, gold, or light brown color variations. 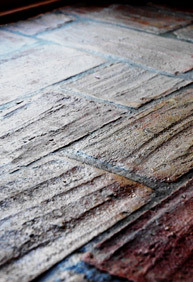 We only use non-toxic natural waxes to finish our tiles. Every single tile is handmade and hand finished. Contact us regarding your color preferences at 1-417-664-3524. 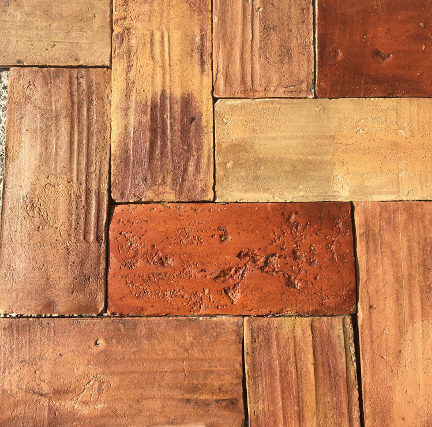 IN STOCK: Antique French Reclaimed Terra cotta Flooring. Photo: Reclaimed approx. 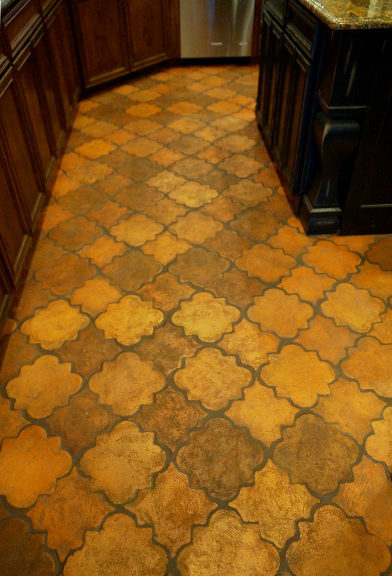 150 years old French Terra Cotta Tiles. 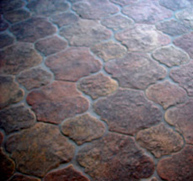 These amazing terra cuite tiles in stock direct from France and are selling them for half the retail price. They are 6x12" in size and 0.5" thick. 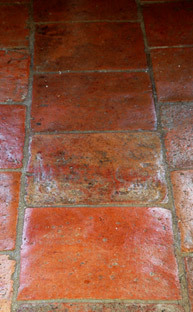 Size and colors may vary as tiles are reclaimed throughout France and not from one single lot. These tiles are from the 1800's and are considered Ancient. They can be used in any high traffic areas inside and out. Contact us if you are interested as they are ready to ship! Photo taken of unsealed (laid and grouted only) tiles by Chris Lobo, one of our clients whom purchased the tiles from us and installed them himself. Great Job Chris! "Here is a picture of our completed floor. Thank-you for the photo Susan! Your kitchen looks amazing! ___________________________________________________________________ IN STOCK: Photo on the left. 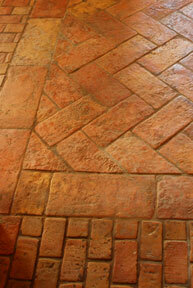 Handmade Terra Cotta tiles with Antique Texture in size 12x12" and Step Coping tiles to match! Contact us today at 417-664-3524 . 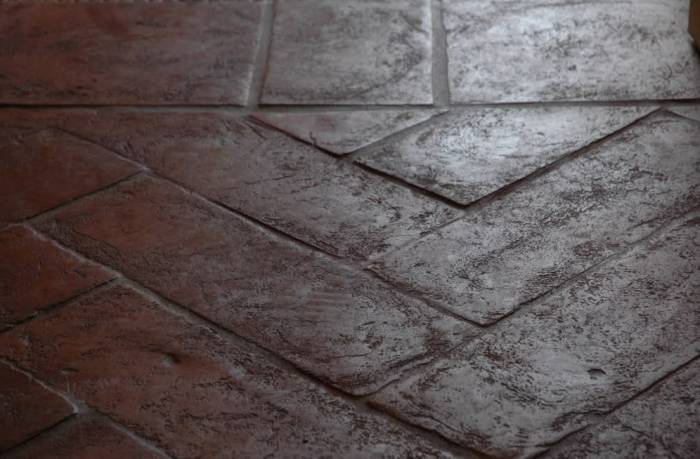 AncientFloors.com presents Exclusive Handmade Antique Rustic Old World Terra Cotta (Italian: "Baked Earth") Tile that looks over 100 Years Old. 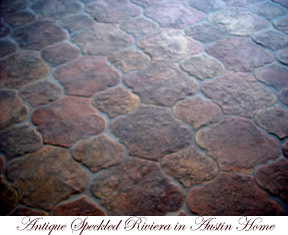 You can order any design or pattern of freshly baked handmade tile with the texture that looks antique. 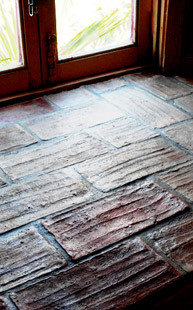 We offer authentic tiles from France, Italy, Spain and Mexico. We also make trips to Europe every year in a search of Reclaimed materials. 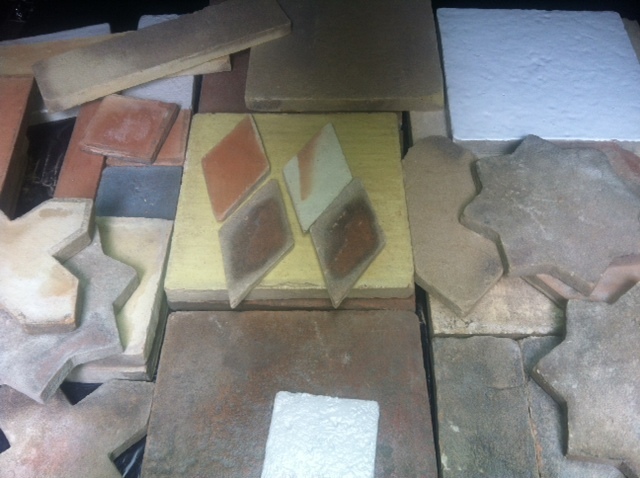 Currently we have several containers coming to US with gorgeous reclaimed and new tiles from France and Italy. 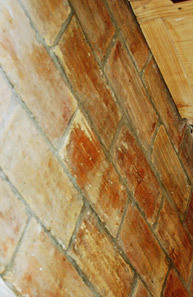 Terra cotta has been used throughout history for sculpture and pottery, as well as bricks and roof shingles. In ancient times, the first clay sculptures were dried (baked) in the sun after being formed. Later, they were placed in the ashes of open hearths to harden, and finally kilns were used, the same process we use in our factory today. Only after firing to high temperature would it be classed as a ceramic material strong enough to be used for the flooring. 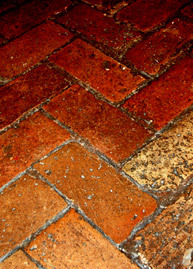 Terra Cotta flooring was very popular in ancient Roman times. 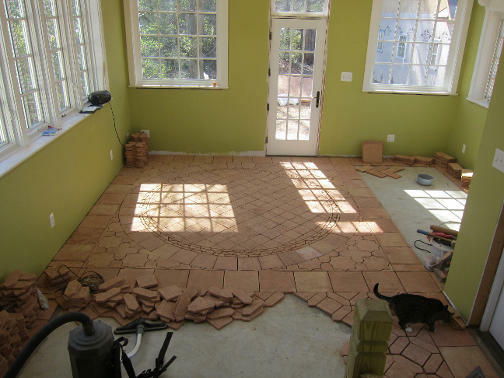 Large terra cotta tiles were used in first radiant heating applications in ancient Roma. During the Roman Empire the art of natural terra cotta and stone flooring reached a new height of innovation. These masters of architecture were able to design a series of floors that actually glowed with toasty warmth from below. These were the first below surface radiant heating systems. This process made use of large tiles, propped up on joists, so that a gap was created beneath the surface of the floor. A furnace would then be placed at one end of this gap and lit, while a vent would be placed at the other end. This would draw heat continuously across the bottom of the floor, warming it considerably. 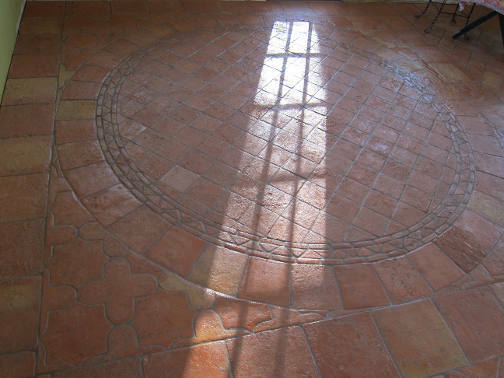 These heated floors were used in the homes of the wealthy throughout the life of the empire. Italians treasured terra cotta traditions throughout the history. One of the great examples of their respect for terra cotta flooring is wide numbers of chapels dated back to 15-th century in Bologna region. Chapels present incredible three-dimensional ornaments on the ceilings, richly decorated interiors and bold traditional terra cotta flooring. 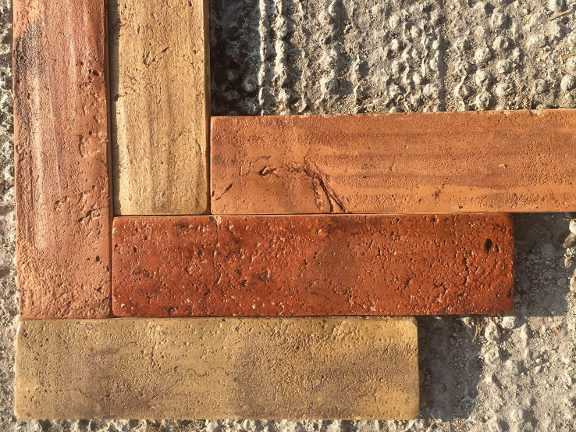 Just like centuries ago, our manufacturers use wood burned kilns to create natural multicolored terra cotta tiles and bricks. Each of our tiles has unique timeless multicolored reflection of the fire resembling a stamp of proof that tiles were baked in a real wood burning kiln. We own several warehouses totaling 14000 sq feet. As you can see they are full of tiles. 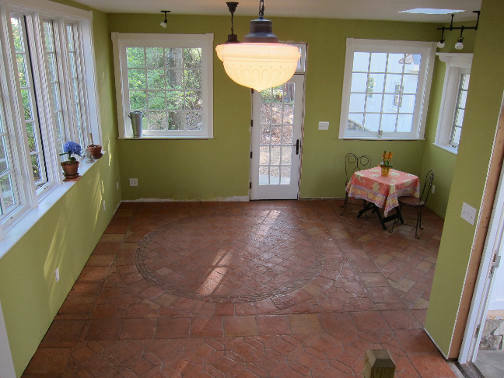 3 photos below: Terra cotta tiles in home of famous and very talented artists Rob and Lina Liberace. Lina designed the layout of the floor herself and they installed the tiles themselves in their spare time, and we think they have done a wonderful job! Prices are reasonable and available upon request.